1100 1100 0% off in Rs. Growth in demand for chemicals in developing countries is high leading to substantial cross border investment in the chemical sector. The chemical industry comprises the companies that produce industrial chemicals. Chemicals are used to make a wide variety of consumer goods, as well as thousands inputs to manufacturing, construction, and service industries. The applications of industrial chemical are in various fields like in organic chemicals, paint, varnishes, resins, petroleum, pigments, printing inks, acrylics polyesters engineering thermoplastics. The chemical industry itself consumes 26 percent of its own output. In modern age chemical industries have permeated most extensively in comparison with other industries and are progressing at a very rapid pace. Chemical industry is one of the oldest industries in India. It not only plays a crucial role in meeting the daily needs of the common man, but also contributes significantly towards industrial and economic growth of the nation. The chemical industry forms the backbone of the industrial and agricultural development and provides building blocks for downstream industries; it is an important constituent of the Indian economy. The chemical industry in India which generates almost 13% of total national export is growing annually at a growth rate anywhere between 10% and 12%. Global chemical production is growing and the growth is contributed by the chemical industry of developing countries. The book contains manufacturing processes, reactions, equipments details, process flow diagram of number of chemicals, which have huge industrial uses. The major contents of the book are iodine from oil well brines, lactic acid from corn sugar, modern production of chlorine and caustic soda, organic chemicals, chemicals derived from methane and so on. This book is very useful for new entrepreneurs, industrialists, consultants, research scholars, technical institutions, chemists and libraries. This book is recommended to all related to field of chemical process technology. Properties Of Typical Commercial Bisphenol A Epoxy Resins. Petroleum is a mixture of hydrocarbons-chemical combinations of hydrogen and carbon. When burned completely, the hydrocarbons should yield only water (H2O) and carbon dioxide (CO2). When the burning is incomplete, carbon monoxide (CO) and various oxygenated hydrocarbons are formed. Since most burning uses air, nitrogen compounds also exist. In addition, there are other elements associated with the hydrocarbons in petroleum such as sulfur, nickel, and vanadium, just to name a few. Petroleum is found normally at great depth underground or below seabeds. It can exist as a gas, liquid, solid, or a combination of these three states. Drilling is used to reach the gaseous and liquid deposits of petroleum. Then they are brought to the surface through pipe. The gas usually flows under its own pressure. The liquid may flow from its own pressure or be forced to the surface by submerged pumps. Solid or semisolid petroleum is brought to the surface in a number of ways: by digging with conventional mining techniques, by gasifying or liquefying with high temperature stream, or by burning a portion of the material in the ground so that the remainder can flow to the surface. Natural gas is the gaseous form of petroleum. It is mostly the single-carbon molecule, methane (CH4). When natural gas is associated with liquid petroleum underground, the methane will come to the surface in admixture with some heavier hydrocarbons. The gas is then said to be a wet gas. These heavier hydrocarbons are isolated and purified in natural gas processing plants. The operation yields ethane (petrochemical feed), propane (LPG) butane (refinery blending stock), and hydrocarbon liquids (natural gas condensate). When the underground natural gas is associated with solid hydrocarbons such as tar or coal, the methane will have little other hydrocarbons. Then the gas is said to be a dry gas. Crude oil is the common name given to the liquid form of petroleum. In some writings, one will see reference to "petroleum and natural gas,"suggesting petroleum and crude oil are used as synonymous terms. Some crude oils have such great density that they are referred to as heavy oils and tars. Tar sands are small particles of sandstone surrounded by an organic material called bitumen. The bitumen is so highly viscous and clings so tenaciously to the sandstone that it is easy to think of the mixture as a soild form of petroleum. Yet it is a mixture of high density liquid on a supporting solid. Oil Shales are real petroleum solids. The curious thing about oil shales is that they do not contain petroleum crude oil. Instead, they contain an organic material called kerogen. The kerogen can be heated to yield a liquid substance called shale oil, which in turn can be refined into more conventional petroleum products. Many products derived from petroleum are partly the consequence of the vast collection of hydrocarbons occurring in petroleum's natural state. A far more important factor is the ability of the hydrocarbon processing industries to transpose laboratory discoveries into large-scale commercial operations. Thus, the petroleum industry is an interesting study in applied organic chemistry and physical property manipulation. Most of this discussion will concern the processing of petroleum crude oil, the most widely used form of petroleum resources. Natural gas processing will come in briefly at a few points. And since most of the world's petroleum is consumed as energy fuels, it is appropriate to begin with a brief review of the world's total energy situation. Coal offers a much more abundant primary source of energy than does petroleum. This is certainly true, but another fact remains: the world presently gets most of its energy from curde oil and natural gas. Petroleum is the major source of fuel used in transportation, manfacturing and home heating. Primary energy sources are defiend as those coming from natural raw materials. Electricity is not included because it is a secondary energy source; that is, generated by consuming one or more of the other natural energy sources. To put petroleum consumption into perspective, the primary energy sources considered here are: petroleum crude oil, natural gas, coal, hydropower (water to generate electricity), and nuclear energy. The quantities reported here will exclude energy from wood, peat, aniaml waste, and other sources - despite their importance to some localities. Documentation for these latter sources is sketchy, whereas the other energy sources are well documented. The common practice is to relate energy units to a common product - in this case to petroleum liquid. By contrast, when the product from crude oil is limited to only one or two specific hydrocarbons of fairly high purity, the fraction is called a petrochemical. Examples of petrochemicals are: ethylene, propylene, benzene, toluene, and styrene - to name only a few. There are many more identifiable petrochemical products than there are refined products. There are many specific hydrocarbons that can be derived from petroleum. However, these hydrocarbons lose individual identity when they are grouped into a refined product. Most refined products at the consumer level are blends of several refinery streams. Product specifications determine which streams are suitable for a specific blend. Part of the difficulty of learning about refining lies in the industry's use of stream names that are different from the names of the consumer products. Consider the listing in Table 1. The names in the last column should be familiar because they are used at the consumer level. 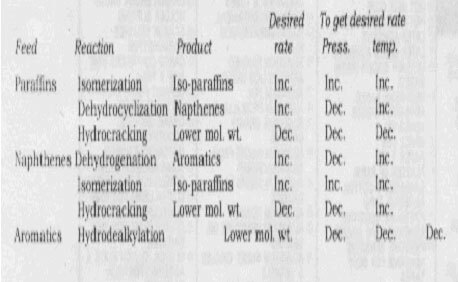 Yet within a refinery, these products will be blended from portions of crude oil fractions having the names shown in the first column. To make matters worse, specifications and statistics for the industry are often reported under yet another set of names - those shown in the middle column of Table 1. Gasoline at the cosumer level, for example, may be called benzol or petrol, depending on the country where it is sold. In the early stages of crude oil processing, most gasoline components are called naphthas. Kerosine is another example. It may be called coal oil to denote that it replaces stove oil (or range oil) once derived from coal. Kerosine's historical significance was first as an illuminating oil for lamps that once burned sperm oil taken from whales. But today, kerosine fractions go mostly into tranportation fuels such as jet fuel and high quality No. 1 heating oil. Product application and customer acceptance set detailed specifications for various product properties. Boiling range is the major distinction among refined products, and many other properties are related directly to the products in these boiling ranges. A summary of ASTM specifications for fuel boiling ranges is given in Table 2. 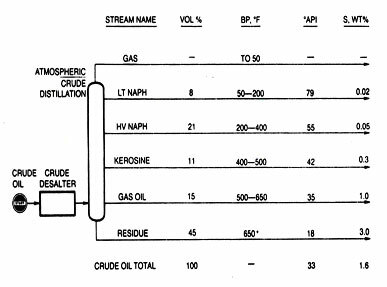 Boiling range also is used to identify individual refinery streams __ as an example will show in a later section concerning crude oil distillation. The temperature that separates one fraction from an adjacent fraction will differ from refinery to refinery. Factors influencing the choice of cut point temperatures includes the following: type of crude oil feed, kind and size of downstream processes, and relative market demand among products. Other specifications can involve either physical or chemical properties. Generally these specifications are stated as minimum or maximum quantities. Once a product qualifies to be in a certain group, it may receive a premium price by virtue of exceeding minimum specifications or by being below maximum specifications. Yet all too often, the only advantage for being better than specifications is an increase in the volume of sales in a competitive market. The evolution of product specifications will, at times, appear sadly behind recent developments in more sophisticated analytical techniques. Certainly the ultimate specification should be based on how well a product performs in use. Yet the industry has grown comfortable with certain comparisons, and these standards are retained for easier comparisons with earlier products. Thus, it is not uncommon to find petroleum products sold under an array of tests and specifications__some seemingly measuring similar properties. It is behind the scenes that sophisticated analytical techniques prove their worth. These techniques are used to identify specific hydrocarbons responsible for one property or another. Then suitable refining processes are devised to accomplish a desired chemical reaction that will increase the production of specific type of hydrocarbons. In the discussion on refining schemes, major specifications will be identified for each product category. It will be left to the reader to remember that a wide variety of other specifications also must be met. As changes occur in relative demand for refined products, refiners turn their attention to ways that will alter internal refinery streams. The big problem here is that the increase in volume of one fraction of crude oil will deprive some other product of that same fraction. This point is often overlooked when the question arises: "How much of a specific product can a refinery make?" Such a question should always be followed by a second question: "What other products will be penalized?" Envision, for example, what would happen if the refining industry were to make all the gasoline it possibly could with today's present technology. The result would be to rob many other petroleum products. A vehicle that needs gasoline for fuel also needs such product as industrial fuels to fabricate the vehicle, lubricants for the engine's operation, asphalt for roads upon which the vehicle is to move, and petrochemical plastics and fibers for the vehicle's interior. Until adequate substitutes are found for these other petroleum products, it would be unwise to make only one product, even though sufficient technology may exist to offer this option. This is not to say that substitutes will not be found, that these substitutes will not be better than petroleum products. In fact, many forecasts suggest that petroleum will ultimately be allocated only to transportation fuels and petrochemical feedstocks. It appears that these uses are the most suitable options for petroleum crude oil. hflash point specified instead of front end distillation. The portion of crude oil going to petrochemicals may appear small compared to fuels, but the variety of petrochemicals is huge. The listing in Table 3 will give some idea of the range of petrochemical applications. A few will be included here as they come into competition with the manufacture of fuels. Despite their variety, all commercially manufactured petrochemicals account for the consumption of only a small part of the total crude oil processed. A refinery is a massive network of vessels, equipment, and pipes. The total scheme can be divided into a number of unit processes. In the discussion to follow, only major flow streams will be shown, and each unit will be depicted by a single block on a simplified flow diagram. Details will be discussed later. Antifreezes Elastomers Insecticides Rust inhib. Refined products establish the order in which each refining unit will be introduced. Only one or two key product specifications are used to explain the purpose of each unit. Nevertheless, the reader is reminded that the choice from among several types of units and the size of these units are complicated economic decisions. The trade-offs among product types, quantity, and quality will be mentioned to the extent that they influence the choice of one kind of process unit over another. Each refinery has its own range of preferred crude oil feedstock for which a desired distribution of products is obtained. The crude oil usually is identified by its source country, underground reservoir, or some distinguishing physical or chemical property. The three most frequently specified properties are density, chemical characterization, and sulfur content. Where sp gr is the specific gravity, or the ratio of the weight of a given volume of oil to the weight of the same volume of water at a standard temperature, usually 60Â°F. An oil with a density the same as that of water, or with a specific gravity of 1.0, would then be 10Â° API oil. Oils with higher than 10Â°API gravity are lighter than water. Since lighter crude oil fractions are usually more valuable, a crude oil with a higher Â°API gravity will bring a premium price in the market place. Heavier crude oils are getting renewed attention as supplies of lighter crude oil dwindle. The U.S. Bureau of Mines defined heavy crudes as those of 25Â° API or less. More recently, the American Petroleum Institute proposed to use 20Â°API or less as the distinction for heavy crude oils. Where TB is the absolute boiling point in degrees Rankin, and sp gr is specific gravity compared to water at 60Â°F. For a wide boiling range material like crude oil, the boiling point is taken as an average of the five temperatures at which 10, 30, 50, 70, and 90 percent are vaporized. A highly paraffinic crude oil might have a characterization factor as high as 13, whereas a highly naphthenic crude oil could be as low as about 10.5. Highly paraffinic crude oils can also contain heavy waxes which make it difficult for the oil to flow. Thus, another test for paraffin content is to measure how cold a crude oil can be before it fails to flow under specific test conditions. The higher the pour point temperature, the greater the paraffin content for a given boiling range. Sour and sweet are terms referring to a crude oil's approximate sulfur content. In early days, these terms designated smell. A crude oil with high sulfur content usually contains hydrogen sulfide- the gas associated with rotten eggs. Then the crude oil was called sour. Without this disagreeable odor, the crude oil was judged sweet. Today, the distinction between sour and sweet is based on total sulfur content. A sour crude oil is one with more than 0.5 wt% sulfur, whereas a sweet crude oil has 0.5 wt % or less sulfur. It has been estimated that 58 percent of U.S.crude oil reserves are sour. More important, an estimated 81 percent of world crude oil reserves are sour. ASTM distillation is a test precribed by the American Society for Testing and Materials to measure the volume percent distilled at various temperatures. The results are often reported the other way around: the temperatures at which given volume percents vaporize. These data indicate the quantity of conventional boiling range products occuring naturally in the crude oil. Analytical tests on each fraction indicate the kind of processing that may be needed to make specification product. A plot of boiling point, sulfur content, and API gravity for fractions of Light Abrabian crude oil is shown in Fig. 1 This crude oil is among the ones most traded in the international crude oil market. In effect, Fig. 1 shows that the material in the mid-volume range of Light Arabian crude oil has a boiling point of approximately 600Â°F, a liquid density of approximately 30Â° API and approximate sulfur content of 1.0 wt %. These data are an average of eight samples of Light Arabian crude oil. More precise values would be obtained on a specific crude oil if the data were to be used in design work. Since a refinery stream spans a fairly wide boiling range, the crude oil analysis data would be accumulated throughout that range to give fraction properties. The intent here is to show an example of the relation between volume distilled, boiling point, liquid density, and sulfur content. Crude oil comes from the ground admixed with a variety of substances: gases, water, and dirt (minerals). The technical literature devoted to petroleum refining often omits crude oil cleanup steps. It is likely presumed that the reader wishing to compare refining schemes will understand that the crude has already been through these cleanup steps. Yet cleanup is important if the crude oil is to be transported effectively and to be processed without causing fouling and corrosion. Cleanup takes place in two ways: field sepration and crude desalting. Field sepration is the first attempt to remove the gases, water, and dirt that accompany crude oil coming from the ground. As the term implies, field sepration is located in the field near the site of the oil wells. The field seprator is often no more than a large vessel that gives a quieting zone to permit gravity sepration of three phases: gases, crude oil, and water (with entrained dirt). The crude oil is lighter than water but heavier than the gases. Therefore, crude oil appears within the field separator as a middle layer. The water is withdrawn from the bottom to be disposed of at the well site. The gases are withdrawn from the top to be piped to a natural gas processing plant or are pumped back into the oil well to maintain well pressure. The crude oil from the middle layer is pumped to a refinery or to a storage awaiting transportation by other means. Crude desalting is a water-washing operation performed at the refinery site to get additional crude oil cleanup. The crude oil coming from field separators will continue to have some water and dirt entrained with it. Water washing removes much of the water-soluble minerals and entrained solids. If these crude oil contaminants were not removed, they would cause operating problems during refinery processings. The solids (dirt and silt) would plug equipment. Some of the solids, being minerals, would dissociate at high temperature and corrode equipment. Still others would deactivate catalysts used in some refining processes. The importance of boiling range for petroleum products already has been discussed in connection with Table. 4. The simplest form of refining would isolate crude oil into fractions having boiling ranges that would coincide with the temperature ranges for consumer products. Some treating steps might be added to remove or alter undesirable components, and a very small quantity of various chemical additives would be included to enhance final properties. Crude oil distillation separates the desalted crude oil into fractions of differing boiling ranges. Instead of trying to match final product boiling ranges at this point, the fractions are defined by the number and kind of downstream processes. 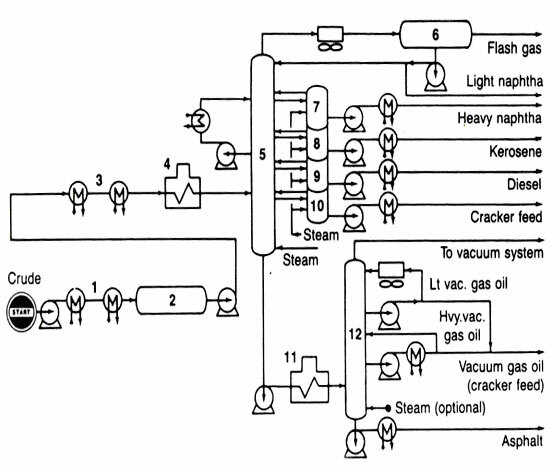 The desalting and distillation units are depicted in Fig.2 to show the usual fractions coming from crude oil distillation units. The discussion in the following paragraphs shows the relationships between some finished products and downstream processing steps. The light and heavy naphtha fractions from crude oil distillation are ultimately combined to make gasoline. The two streams are isolated early in the refining scheme so that each can be refined separately for optimum blending in order to achieve required specifications-- of which only volatility, sulfur content, and octane number will be discussed. A gasoline's boiling range is important during its aspiration into the combustion chamber of a gasoline-powered engine. Vapor pressure, a function of the fuel's boiling range, is also important. Boiling range and vapor pressure are lumped into one concept, volatility. Lighter components in the gasoline blend are established as a compromise between two extremes: enough light components are needed to give adequate vaporization of the fuel - air mixture for easy engine starting in cold weather, but too much of the light components can cause the fuel to vaporize within the fuel pump and result in vapor lock. Environmental studies suggest that hydrocarbons in the atmosphere near large cities are the result of evaporation of lighter components from the gasoline in automobilies. This evaporation is reduced by designing automobile to use closed fuel systems and fuel-injected engines. Then the concentration of the lighter components in the fuel can be reduced and is not so critical as it is for fuel-aspirated engines. Heavier components are a trade-off between fuel volume and combustion chamber deposits. They extend the yield of gasoline that can be made from a given volume of crude oil, but they also contribute to combustion chamber deposits and spark plug fouling. Thus, an upper limit is set on gasoline's boiling range to give a clean-burning fuel. Sulfur compounds are corrosive and foulsmelling. When burned in an engine, these compounds result in sulfur dioxide exhaust. Should the engine be equipped with a catalytic muffler, as is the case for many modern automobiles engines, the sulfur is exhausted from the muffler as sulfur trioxide, or sulfuric acid mist. Caustic wash or some other enhanced solvent washing technique is usually sufficient to remove sulfur from light naphtha. The sulfur compounds in light naphtha are mercaptans and organic sulfides that are removed readily by these washing processes. Heavy naphtha is harder to desulfurize. The sulfur compounds are in greater concentration and are of more complicated molecular structure. A more severe desulfurization method is needed to break these structures and release the sulfur. One such process is hydrotreating. Hydrotreating is a catalytic process that converts sulfur-containing hydrocarbons into low-sulfur liquids and hydrogen sulfide. The process is operated under a hydrogen-rich blanket at elevated temperature and pressure. A separate supply of hydrogen is needed to compensate for the amount of hydrogen required to occupy the vacant hydrocarbon site once held by the sulfur. Also, hydrogen is consumed to convert the sulfur to hydrogen sulfide gas. Nitrogen and oxygen compounds are also dissociated by hydrotreating. The beauty of the process is that molecules are split at the points where these contaminants are attached. For nitrogen and oxygen compounds, the products of hydrotreating are ammonia and water, respectively. Thus, the contaminants will appear in the offgases and are easily removed by conventional gas treating processes. Another condition to keep gasoline engines running smoothly is that the fuel-air mixture start burning at a precise time in the combustion cycle. An electrical spark starts the ignition. The remainder of the fuel-air mix should be consumed by a flame front moving out from the initial spark. Under some conditions, a portion of the fuel-air mixture will ignite spontaneously instead of waiting for the flame front from the carefully timed spark. The extra pressure pulses resulting from spontaneous combustion are usually audible above the normal sounds of a running engine and give rise to the phenomenon called knock. Some special attributes of the knocking phenomenon are called pinging and rumble. All of these forms of knock are undesirable because they waste some of the available power of an otherwise smooth-running engine. Octane number is a measure of a fuel's ability to avoid knocking. The octane number of a gasoline is determined in a special single cylinder engine where various combustion conditions can be controlled. The test engine is adjusted to give trace knock from the fuel to be rated. Then various mixtures of iso-octane (2,2,4-trimethyl pentane) and normal heptane are used to find the ratio of the two reference fuels that will give the same intensity of knock as that from the unknown fuel. 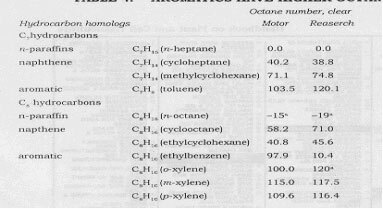 Defining iso-octane as 100 octane numbers and normal heptane as 0 octane number, the volumetric percentage of iso-octane in heptane that matches knock from the unknown fuel is reported as the octane number of the fuel. For example, 90 vol % iso-octane and 10-vol % normal heptane establishes a 90 octane number reference fuel. Two kinds of octane number ratings are specified, although other methods are often used for engine and fuel development. Both methods use the same reference fuels and essentially the same test engine. Engine operating conditions are the difference. In one, called the Research Method, the spark advance is fixed, the air inlet temperature is 125Â°F and engine is 600 rmp. The other, called the Motor method, uses variable spark timing, a higher mixture temperature (300Â°F), and a faster engine speed (900rpm). The more severe conditions of the Motor method have a great influence on commercial blends than they do on the reference fuels. Thus, a Motor octane number of a commercial blend tends to be lower than the Research octane number. Recently, it has become the practice to label gasoline with an arithmetic average of both ratings, abbrieviated (R+M) / 2. Catalysts for reforming typically contain platinum or a mixture of platinum and other metal promoters on a silica- alumina support. Only a small concentration of platinum is used, averaging about 0.4wt %. The need to sustain catalyst and the expense of platinum make it common practice to pretreat the reformer's feedstock to remove catalyst poisons. Jet fuel, kerosine (range oil), No. 1 fuel oil, No. 2 fuel oil, and diesel fuel are all popular distillate products coming from 400Â°F to 600Â° F fractions crude oil. One grade of jet fuel uses the heavy naphtha fraction, but the kerosine fraction supplies the more popular heavier grade of jet fuel, with smaller amounts sold as burner fuel (range oil) or No. 1 heating oil. Some heating oil (generally No. 2 heating oil) and diesel fuel are very similar and are sometimes substituties for each other. The home heating oil is intended to be burned within a furnace for space heating. The diesel fuel is intended for compression-ignition engines. Hydrotreating improves the properties of all these distillate products. The process not only reduces the sulfur content of the distillates to a low level but also hydrogenates unsaturated hydrocarbons so that they will not contribute to smoke and particulate emissions -whether the fuel is burned in a furnace or used in an engine. Crude oil is seldom distilled at temperatures above about 650Â°F. At higher temperatures, coke will form and plug the lower section of the crude oil distillation tower. Therefore, the portion with a boiling point above 650Â°F is not vaporized-or at least not with the processing units introduced so far. This residual liquid disposed of as industrial fuel oils, road oils, and so forth. The residual is sometimes called reduced crude because the lighter fractions have been removed. The refining scheme evolved to this point is shown in Fig 3. It is typical of a low-investment refinery designed to make products of modern quality. Yet the relative amounts of products are dictated by the boiling range of the crude oil feed. For Light Arabian crude oil reported earlier, all distillate fuel oils and lighter products (those boiling below 650Â°F) would comprise only about 55-vol % of the crude oil feed rate. For industrialized areas where the principal demand is for transportation fuels or high-quality heating oils, a refining scheme of the type shown in Fig .3 would need to dispose of almost half of the crude oil as low-quality, less desirable, residual products. Moreover, the price obtained for these residual products is not only much lower than revenues from lighter products but also lower than the cost of the original crude oil. Thus, there are economic incentives to convert much of the residual portions into lighter products of suitable properties. These processes cause hydrocarbon molecules to break apart into two or more smaller molecules. Thermal cracking uses high temprature (above 650Â°F) and long residence time to accomplish the molecular split. Catalytic cracking accomplishes the split much faster and at lower temperatures because of the presence of a cracking catalyst. Catalytic cracking involves not only some of the biggest units, with their large catalyst reactor-separators and regenerator, but it is also among the more profitable operations with its effective conversion of heavy feeds to light products. Gasoline from catalytic cracking has a higher octane number than thermally cracked gasoline. Yields include less gas and coke than thermal cracking; that is, more useful liquid products are made. The distribution of products between gasoline and heating oils can be varied by different choices for catalysts and operating conditions. The best feeds for catalytic crackers are determined by a number of factors. The feed should be heavy enough to justify conversion. This usually sets a lower boiling point of about 650Â° F. The feed should not be so heavy that it contains undue amounts of metal-bearing compounds or carbon- forming materials. Either of these substances is more prevalent is heavier fractions and can cause the catalyst to lose activity more quickly. Visbreaking is basically a mild, once through thermal-cracking process. It is used to get just sufficient cracking of resid so that fuel oil specifications can be made. Although some gasoline and light distillates are made, this is not the purpose of the visbreaker. Coking is another matter. It is a severe form of thermal cracking in which coke formation is tolerated to get additional lighter liquids from the heavier, dirtier fractions of crude oil. Here, the metals that would otherwise foul a catalytic process are laid down with the coke. The coke settles out in large drums that are removed from service frequently (about one a day) to have the coke cut out with high-pressure water lances. To make the process continuous, multiple coke drums are used so that some drums can be onstream while others are being unloaded. Hydrocracking achieves cracking with a rugged catalyst to withstand resid contaminants and with a hydrogen atmosphere to minimize coking. Hydro cracking combines hydrotreating and catalytic-cracking goals, but a hydrocracker is much more expensive than either of the other two. The pressure is so high (up to 3000psi) that very thick walled vessels must be used for reactors (up to 9 inches thick). The products from a hydrocracker will be clean (desulfurized, denitrified, and demetalized) and will contain isomerized hydrocarbons in greater amount than in conventional catalytic cracking. A significant part of the expense of operating a hydrocracker is for the hydrogen that it consumes. 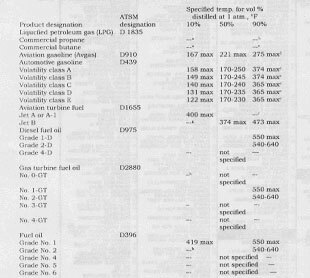 Among the greater variety of products made from crude oil, some of the products (lubricating oils for example)having boiling ranges that exceed 650oF - the general vicinity where cracking would occur in atmospheric distillation. Thus, by using a second distillation unit under vacuum, the heavier parts of the crude oil can continue to be divided into specific products. Furthermore, some of the fractions distilled from vacuum units are better than atmospheric residue for cracking because the metal-bearing compounds and carbon-forming materials are more highly concentrated in the vacuum residue. Cracking processes to convert heavy liquids to lighter liquids also make gases. Another way to make more liquid products is to combine gaseous hydrocarbons. A few small molecules of a gas can be combined to make one bigger molecular with fairly specific properties. Here, a gas separation unit is added to the refinery scheme to isolate the individual types of gases. When catalytic cracking is also part of the refining scheme, there will be a greater supply of olefins - ethylene, propylene, and butylene. Two routes for reconstituing these gaseous olefins into gasoline blending stocks are described below. Polymerization ties two or more olefins together to make polymer gasoline. The double bond in only one olefin is changed to a single bond during each link between two olefins. This means the product will still have a double bond. For gasoline, these polymer stocks are good for blending beacuse olefins tend to have higher octane numbers than their paraffin homolog. However, the olefinic nature of polymer gasoline can also be a drawback. During long storage in warmer climates, the olefins can continue to link up to form bigger molecules of gum and sludge. This effect, though, is seldom important when the gasoline goes through ordinary distribution systems. Alkylation combines an olefin and isobutane when gasoline is desired. The product is mostly isomers. If the olefin were butylene, the product would contain a high concentration of 2,2,4-trimethyl pentane. The reader is reminded that this is the standard compound that defines 100 on the octane number scale. Alkylates are high-quality gasoline-blending compounds, having good stability as well as high octane numbers. Ether processes combines an alcohol with an iso-olefin. This is a recent addition to the gasoline-manufacturing scheme. These processes were prompted by newer regulations requiring gasoline blends to contain some oxygenated compounds. When the alcohol is methanol and the iso-olefin is isobutylene, the product is methyl tertiary butyl ether (MTBE). When the alcohol is ethanol, and product is ethyl tertiary butyl ether (ETBE). When the alcohol is methaonal and the iso-olefin is isoamylene, the product is tertiary amyl methyl ether (TAME). A refining scheme incorporating the processes discussed so far is show in Fig. 4. The variations are quite numerous, though. Types of crude oil available, local product demands, and competitive quality goals are just a few of the factors considered to decide a specific scheme. Many other processes play an important role in the final scheme. A partial list of these other processes would have the following goals: dew axing lubricating oils, deoiling waxes, deasphalting heavy fractions, manufacturing specific compounds for gasoline blending (alcohols, ethers etc. ), and isolating specific fractions for use as petrochemical feedstocks. It has already been mentioned that petrochemicals account for only a little more than 7 vol % of all petroleum feedstocks. Ethylene is one of the most important olefins. It is usually made by cracking gases - ethane, propane, butane or a mixture of these as might exist in a refinery's offgases. When gas feedstock is scarce or expensive, naphthas and even whole crude oil have been used in specially designed ethylene crackers. The heavier feeds also give significant quantities of higher molecular weight olefins and aromatics. Aromatics, as were pointed out, are in high concentration in the product from a catalytic reformer. When aromatics are needed for petrochemical manufacture, they are extracted from the reformer's product using solvent such as glycols or sulfolane, to name two popular ones. The mixed aromatics are called BTX as an abbreviation for benzene, toluene, and xylene. The first two are isolated by distillation, and the isomers of the third are separated by partial crystallizatoin. Benzene is the starting material for styrene, phenol, and a number of fibers and plastics. Toluene is used to make a number of chemicals, but most of it is blended into gasoline. Xylene use depends on the isomer, para-xylene going into polyester and ortho-xylene going into phthalic anhydride. Both are involved in a wide variety of consumer products. So far, refining units have been described as they relate to other units and to final product specifications. Now, typical flow diagrams of some major processes will be presented to highlight individual features. In many cases, the specific design shown is an arbitrary choice from the work of several equally qualified designers. 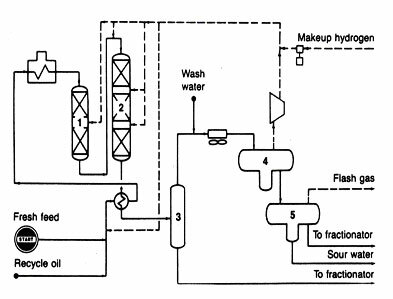 Basically a water-washing process, the crude desalter must accomplish intimate mixing between the crude oil and water, then separate them sufficiently so that water will not enter subsequent crude-oil distillation heaters. A typical flow diagram is shown in Fig. 5. The unrefined crude oil is heated to 100 to 300oF for suitable fluid properties. The operating pressure is 40 psig or more. Elevated temperatures reduce oil viscosity for better mixing, and elevated pressure suppresses vaporization. The wash water can be added either before or after heating. Mixing between the water and crude oil is assured by passing the mixture through a throttling valve or emulsifer orifice. Trace quantities of caustic, acid, or other chemicals are sometimes added to promote treating. Then the water-in-oil emulsion is introduced into a high voltage electrostatic field inside a gravity settler. The electrostatic field helps the water droplets to agglomerate for easier settling. Salts, minerals, and other water-soluble impurities in the crude oil are carried off with the water discharged from the settler. Clean desalted crude oil flows from the top of the settler and is ready for subsequent refining. Additional stages can be used in series to get additional reduction in salt content of the crude oil. Two stages are typical, but some installations use three stages. The increased investment cost for multiple stages is offset by reduced corrosion, plugging, and catalyst poisoning in downstream equipment by virtue of lower salt content. Single or multiple distillation columns are used to separate crude oil into fractions determined by their boiling range. Common identification of these fractions was discussed in connection with Fig. 2., but should only be considered as a guide because a variety of refining schemes call for altering the type of separation made at this point. 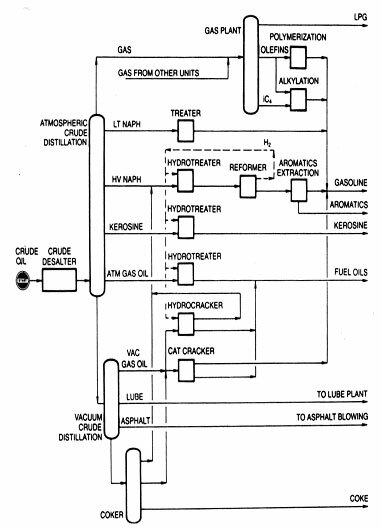 A typcial flow diagram of a two-stage crude oil distillation system is shown in Fig. 6. The crude oil is heated by exchange with various hot products coming from the system before it passes through a fired heater. The temperature of the crude oil entering the first column is 600 to 700oF, or high enough to vaporize the heavy gas oil and all lighter fractions. Because light products must pass form the feed point up to their respective draw off point, any intermediate stream will contain some of these ligher materials. Stream striping the group of steam strippers beside the first is a way to reintroduce these light materials back into the tower to continue their passage up through the column. The bottom stream from the first fractionating column goes into a second column operated under vacuum. Steam jet ejectors are used to create the vacuum so that the absolute pressure can be as low as 30 to 40 mm Hg (about 0.7 psia). The vacuum permits hydrocarbons to be vaporized at temperatures much below their normal boiling points. 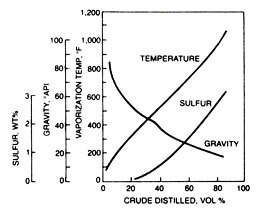 Thus, fractions with normal boiling points above 650oF can be separated by vacuum distillation without causing thermal cracking. Lately, a popular addition to a crude distillation system has been a preflash column ahead of the two stages shown in Fig. 6. The preflash tower strips out the lighter portions of a crude oil before the remainder enters the atmospheric column. It is the ligher portions that set the vapor loading in the atmospheric column, which, in turn determines the diameter of the upper section of the column. Incidentially, total refining capacity of a facility is reported in terms of its crude-oil handling capacity. Thus, the size of the first distillation column, whether a prefalsh or an atmospheric distillation column, sets the reported size of the entire refinery. Ratings in barrels per stream day (bpsd) will be greater than barrels per calnder day (bpcd). Processing units must be shut down on occasion for maintenance, repairs, and equipment replacement. The ratio of operating days to total days (or bpcd divided by bpsd) is called an "onstream factor" or "operating factor.." The ratio will be expressed as either a percent or a decimal. For example, if a refinery nit undergoes one shut down period of one month during a three year duration its operating factor is (36-1)/36, or 0.972, or 97.2 percent. This is a catalytic hydrogenation process that reduces the concentration of sulfur, nitrogen, oxygen metals, and other contaminanats in a hydrocarbon feed. In more severe forms, hydrotreating saturates olefins and aromatics. A typical flow diagram is shown in Fig.7. The feed is pumped to operating pressure and mixed with a hydrogen-rich gas, either before or after being heated to the proper reactor inlet temperature. The heated mixture passes through a fixed bed of catalyst where exothermic hydrogenation reactions occur. The effluent from the reactor is then cooled and sent through two separation stages. In the first, the high-pressure separator, unreacted hydrogen is taken overhead to be scrubbed for hydrogen sulfide removal; the cleaned hydrogen is then recycled. In the second, the lower-pressure separator takes off the remaining gases and light hydrocarbons from the liquid product. If the feed is a wide-boiling range material from which several blending stocks are to be made, the hot low pressure is followed by a fractionation column to remove various liquid fractions. Fig 7. Hydrotreating reactor (1), hot high-pressure separator, hot low-pressure separator (3), cold high-pressure separator (4), cold low-pressure separator (5), and product fractionator (6). The feed for hydrotreating can be a variety of different boiling range materials extending from light naphtha to vaccum residues. Generally, each fraction is treated separately to permit optimum conditions--the higher boiling materials requiring more severe treating conditions. For example, naphtha hydrotreating can be carried out at 200 to 500 psia and at 500 to 650Â°F, with a hydrogen consumption of 10 to 50scf/bbl of feed. On the other hand, a residue hydrotreating process can operate at 1000 to 2000 psia and at 650 to 800Â°F, with a hydrogen consumption of 600 to 1200 scf/bbl. Nevertheless, hydrotreating is such a desirable cleanup step that it can justify its own hydrogen manufacturing facilities, although the hydrogen-rich stream obtained as a by-product from catalytic reforming usually is sufficient for most operations. Catalyst formulations constitute a significant difference among hydrotreating processes. Each catalyst is designed to be best suited to one type of feed or one type of treating goal. When hydrotreating is done for sulfur, removal, the process is called hydrodesulfurization, and the catalyst generally is cobalt and molybdenum oxide on alumina. A catalyst of nickel-molybdenum compounds on alumina can be used for denitrogenation and cracked-stock saturation. Some confusion comes from the literature when the term "naphtha reforming" is used to designate processes to make synthesis gas___a mixture containing predominantly carbon monoxide and hydrogen. However, naphtha reforming has another meaning, which is the one intended here___production of an aromatic-rich liquid for use in gasoline blending. A typical flow diagram is shown in Fig. 8. The feed is pumped to operating pressure and mixed with a hydrogen-rich gas before heating to reaction temperatures. Actually, hydrogen is a by-product of the dehydrogenation and cyclization reactions, but by sustaining a hydrogen atmosphere, cracking and coke formation are minimized. The feed for catalytic reforming is mostly in the boiling range of gasoline to start with. The intent is to convert the paraffin and naphthene portions to aromatics. As an example, a 180 to 310Â°F fraction of Light Arabian crude oil was reported to have 8 vol % aromatics before catalytic reforming, but was 68 vol % aromatics afterwards. 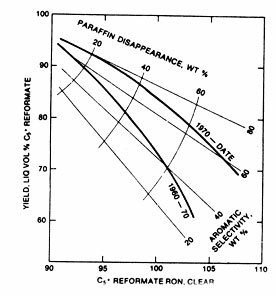 The feed paraffin content (69 vol %) was reduced to less than half, and the feed naphthene content (23 vol %) was almost completely absent in the product. Fig 8. 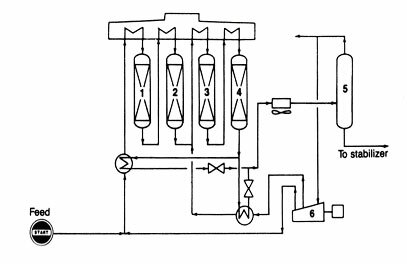 Catalytic reforming-mulltibed reactors (1, 2, 3, 4), common heater, hydrogen separator (5), and compressor (6). The extent of octane number change with changes in molecular configuration is shown in Table 4, where normal paraffins and naphthenes are compared with their aromatic homologs. If the napthenes are condensed (multirings or indanes ) they tend to deactivate the reforming catalyst quickly. Control of the end point of the feed will exclude these deactivating compounds. aBlending value at 20-vol % in 60 octane number reference fuel. Catalysts that promote reforming reactions can give side-reactions. Isomerization is acceptable, but hydrocracking gives unwanted saturates and gases. Therefore, higher operating pressures are used to suppress hydrocracking. This remedy has disadvantages. Higher pressures suppress reforming reactions too, although to a lesser extent. Generally, a compromise is made between desired reforming and undesired hydrocracking. The effects of operating conditions on competing reactions are shown in Table 5. In the late 1960s, it was discovered that the addition of certain promoters, such as rheinum, germanium, or tin, to the platinum containing catalyst would reduce cracking and coke formation. The resulting catalysts, referred to as bimetallic catalysts, permit the process to enjoy the better reforming conditions of lower pressure without being unduly penalized by hydrocracking. Earlier pressures of 500 psig are now down to 150 psig. Operating temperatures are important, too. The reactions are endothermic. Best yields would come from isothermal reaction zones, but they are difficult to achieve. Instead, the reaction beds are separated into a number of adiabatic zones operating at 500 to 1000Â°F with heaters between stages to supply the necessary heat of reaction and hold the overall train near a constant temperature. Three or four reactor zones are commonly used when it is desired to have a product with high octane numbers. In making gasoline with high octane numbers but without the use of antiknock additives, high severity catalytic reforming is the prime route. The big disadvantage is a yield loss. Newer catalysts make the loss less dramatic, but the penalty remains, as can be seen from Fig.9. A typical diagram of a fluid catalytic cracking is shown in Fig 10. The unit is characterized by two huge vessels, one to react the feed with hot catalyst and the other to regenerate the spent catalyst by burning off carbon with air. The activity of molecular-sieve catalysts is so great that the contact time between feed and catalyst is reduced drastically. If not, the oil will overcrack to give unwanted gases and coke. The short contact time is accomplished by using a transfer line between the regenarator and reactor vessels. In fact, the major portion of the reaction occurs in this piece of pipe or riser, and the products are taken quickly overhead. The main reactor vessels then are used to hold cyclone separators to remove the catalyst from the vapor products and to give additional space for cracking the heavier portions of the feed. There are several configurations of reactors and regenerators. In some designs, one vessel is stacked on top of the other. All are big structures (150-200 ft high). Riser cracking, as the short time contacting is called, has a number of advantages. It is easier to design and operate. It can be operated at higher temperatures to give more gasoline olefins. It minimizes the destruction of any aromatics formed during cracking. The net effect can be the production of gasoline having octane numbers two or three numbers higher than earlier designs would give. Better regeneration of the spent catalyst is obtained by operating at higher temperatures (1300-1400Â°F). The coke that is deposited on the catalyst is more completely burned away by higher-temperature air blowing. The newer catalysts are rugged enough to withstand the extra heat, and newer metallurgy gives the regenerator vessel the strength it needs at higher temperatures. Heavier feedstocks can be put into catalytic crackers. The nickel, vanadium, and iron in these heavier fractions do not deactivate the catalysts as fast as they once did because passivators are available now to add to the catalysts. The extra sulfur that comes with heavier feeds can be prevented from exhausting into the atmosphere during regeneration because of catalysts that hold onto the sulfur compounds until the catalysts get into the reactor. Then the sulfur compounds are cracked to light gases and leave the unit with the cracked products. Ordinary gas treating methods are used to capture the hydrogen sulfide coming from the sulfur in the feedstock. Coking is an extreme form of thermal cracking. The process converts residual materials that might not easily be converted by the more popular catalytic cracking process. Coking is also a less expensive process for getting more light stocks from residual fractions. In the coking process, the coke is considered a by-product that is tolerated in the interest of more complete conversion of residues to lighter liquids. A typical flow diagram of a delayed cooker is shown in Fig 11. There are several possible configurations, but in this one the feed goes directly into the product fractionator to pick up heavier product to be recycled to the cracking operation. The term "delayed cooker" signifies that the heat of cracking is added by the furnace, and the cracking occurs during the longer residence time in the following coke drums. Furnace outlet temperatures are in the range of 900 to 950Â°F while the coke drum pressures are in the range of 15 to 90 psig. The coke accumulates in the coke drum, and the remaining products go overhead as vapors to be fractionated into various products. In this case, the products are gas, naphtha, light gas oil, and heavy gas oil, coke. When a coke drum is to be emptied, a large drilling structure mounted on the top of drum is used to make a center hole in the coke formation. The drill is equipped with high-pressure water jets (3000 psig or more ) to cut the coke from the drum so that it can fall out a bottom hatch into a coke pit. From there, belt conveyors and bucket cranes move the coke to storage or to market. Fluid coking is a proprietary name given to a different type of coking process in which the coke is suspended as particles in fluids flowing from a reactor to a heater and back again. When part of the coke is gasified, the process is called Flexi coking. 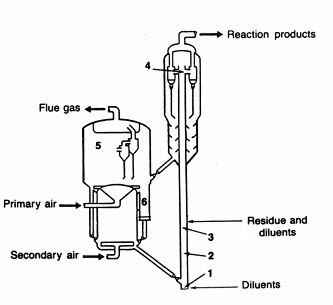 A flow diagram for Flexi coking is shown in Fig.12 The first two vessels are typical of Fluid coking, in which part of the coke is burned in the heater in order to have hot coke nuclei to contact the feed in the reactor vessel. The cracked products are quenched in an overhead scrubber where entrained coke is returned to the reactor. Coke from the reactor circulates to the heater where it is devolatilized to yield a light hydrocarbon gas and residual coke. 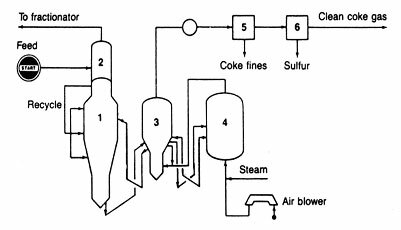 A sidestream of coke is circulated to the gasifier, where, for most feedstocks, 95 percent or more of the gross coke product from the reactor is gasified at elevated temperature with steam and air. Sulfur that enters the unit with the feedstock eventually becomes hydrogen sulfide exiting the gasifier and is recovered by a sulfur removal step. 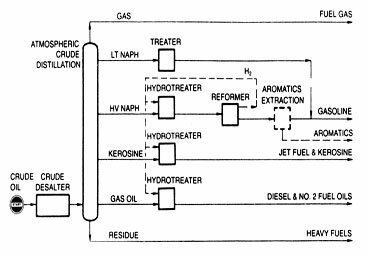 Before the late 1960s, most hydrogen used in processing crude oil was for pretreating catalytic reformer feed naptha and for desulfurizing middle-distillate products. Soon thereafter, requirements to lower sulfur content in most fuels became an important consideration. The heavier fractions of crude oil were the hardest to treat. Moreover, these fractions were the ones offering additional sources of light products. This situation set the stage for the introduction of hydrocracking. 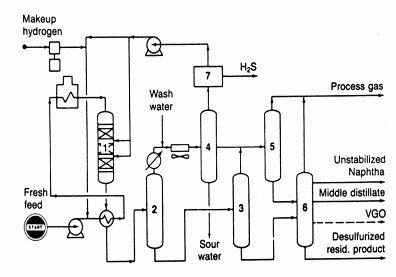 A typical flow diagram for hydrocracking is shown in Fig. 13. 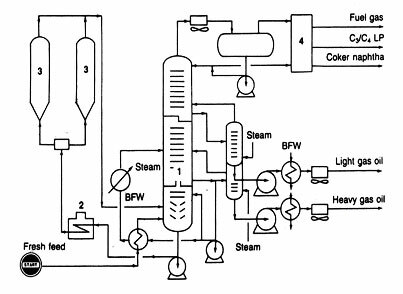 Process flow is similar to hydrotreating in that feed is pumped to operating pressure, mixed with a hydrogen__rich gas, heated, passed through a catalytic reactor, and distributed among various fractions. Yet the hydorcracking process is unlike hydrotreating in several imporatnt ways. Operating pressures are very high, 2000 to 3000 psia. Hydrogen consumption also is high, 1200 to 1600 scf of hydrogen per barrel of feed, depending on the extent of the cracking. In fact, it is not uncommon to see hydrocrackers built with their own hydrogen manufacturing facilities nearby. The catalysts for hydrocracking have a dual function. They give both hydrogenation and dehydrogenation reactions and have a highly acidic support to foster cracking. The hydrogenation- dehydrogenation components of the catalysts are metals such as cobalt, nickel, tungsten, vanadium, molybdenum, platinum, palladium, or a combination of these metals. The acidic support can be silica-alumina, silica-zirconia, silica-magnesia, alumina-boria, silica-titania, acid-treated clays, acidic metal phosphates, or alumina, to name some given in the literature. Great flexibility is attributed to most hydrocracking processes. Under mild conditions, the process can function as a hydrotreater. Under more severe conditions of cracking, the process produces a varying ratio of motor fuels and middle distillates, depending. on the feedstock and operating variables. Even greater flexibility is possible for the process during design stages when it can be tailored to change naphthas into liquefied petroleum gases or convert heavy residues into lighter products. Because the hydrocracker is viewed as both a cracker and a treater it can appear in refining process schemes in a number of different places. As a cracker, it is used to convert feeds that are too heavy or too contaminant-laden to go to catalytic cracking. As a treater, it is used to handle heating-oil fractions that need to be saturated to give good buring quality. But it is the trend to heavier feeds and high-quality fuels that causes hydrocracking to offer advantages to future refining, even though the hydrocracking units are much more expensive to build and to operate. The principle of an ebulliating catalyst bed is embodied in some proprietary designs, in contrast with the fixed-catalyst beds used in other versions of hydrocracking. The H-Oil process of Hydrocarbon Research, Inc. and the LC-Fining process jointly licensed by ABB Lummus Crest Inc., Oxy Research & Development Co., and Amoco Corp. are examples of hydrocracking processes that use an ebullient bed instead of a fixed bed of catalyst. This process usually is associated with the manufacture of plastic films and fibers from light hydrocarbon olefins, with products such as polyethylene and polyproylene. As a gasoline manufacturing process, the polymerization of light olefins emphasizes a combination of only two or three molecules so that the resulting liquid will be in the gasoline boiling range. For early polymerization units, the catalyst was phosphoric acid on a quartz or kieselguhr support. Many of these units were shut down when the demand for gasoline with increased octane numbers prompted the diversion of the olefin feeds to alkylation units that gave higher octane number products. Yet some refinery have more propylene than alkylation can handle, so a newer version of polymerization was introduced. It is the Dimersol process of the Institut Francais du Petrole, for which the flow diagram is shown in Fig.14. The Dimersol process uses a soluble catalytic complex injected into the feed before it enters the reactor. The heat of reaction is taken away by circulating a portion of the bottoms back to the reactor after passing it through a cooling water exchanger. The product goes through a neutralizing system that uses caustic to destroy the catalyst so that the resulting polymer is clean and stable. Typical octane number ratings for the product are 81 Motor and 96.5 Research, unleaded. This is another process that increases the total yield of gasoline by combining some of the gaseous light hydrocarbons some to form bigger molecules boiling in the gasoline range. Alkylation combines isobutane with a light olefin, typically propylene and butylene. A flow diagram for an alkylation unit using sulfuric acid as a catalyst is shown in Fig. 15. Common catalysts for gasoline alkylation are hydrofluoric acid or sulfuric acid. The reaction is favored by higher temperatures, but competing reactions among the olefins to give polymers prevent high-quality yields. Thus, alkylation usually is carried out at low temperatures in order to make the alkylation reaction predominate over the polymerization reactions. Temperatures for hydrofluoric acid__catalyzed reactions are approximately 100Â°F, and for sulfuric acid they are approximately 50Â°F. Since the sulfuric acid-catalyzed reactions are carried out below normal atmospheric temperatures, refrigeration facilities are included. Alkylate product has a high concentration of 2,2,4-trimethyl pentane, the standard for the 100 rating of the octane number scale. Other compounds in the alkylate are higher or lower in octane number, but the lower octane number materials predominate so that alkylate has a Research octane number in the range of 92 to 99. Developments are under way to slant the reactions in favor of the higher-octane materials. Random samples of alkylate quality reported in the literature are summarized in Table 6. Cooperative studies between automobile manufacturers and gasoline producers established the relationship of some gasoline components to automobile engine emissions. It has been shown that the use of gasolines containing some oxygenated compounds, such as alcohols or ethers, will cause the gasoline-fueled engine to emit less carbon monoxide. The favored alcohols are low molecular weight ones, methanol and ethanol. Commercial technology exists for making either alcohol from a variety of raw materials; namely, natural gas, petroleum crude oil, coal, or agricultural grain. A higher molecular weight alcohol, tertiary butyl alcohol (TBA), is another suitable gasoline blending compound.The major drawback in using alcohols in gasolines is that it creates a new set of conditions for safe fuel handling and efficient engine design. On the other hand, the alcohols could be used to make ethers. These have been shown to have fewer blending problems than alcohols and were more compatible with existing gasoline blends. Another environmentally imposed restriction on gasoline blends was to reduce vapor pressure. The restriction was imposed to control hydrocarbon evaporative losses during gasoline storage and automobile refueling. The consequence of this restriction was to reduce the amount of C4 hydrocarbons included in the gasoline blends. A common second feed to the ether manufacturing process, in addition to an alcohol, is isobutylene. Isobutylene is not only one form of the C4 hydrocarbons, but it can be made from the other C4 homologs. So not only is ether manufacture a way to make a desirable oxygenated compound for gasoline blending, but the ether process gives a way to use the C4 hydrocarbons to enhance the antiknock quality of the gasoline without causing the blend to exceed the vapor pressure restriction. Methyl tertiary butyl ether (MTBE) is the more popular ether-blending compound. It is made by reacting methanol with isobutylene. A flow diagram of a typical process is shown in Fig.16. Other desirable ether compounds for gasoline blending can be made in a similar process. For example, ethyl tertiary butyl ether (ETBE) is made from ethanol and isobutylene. Tertiary amyl methyl ether (TAME) is made from methanol and isoamylene. The manufacture of fibers, films, construction materials, and many synthetic organic chemicals made from petroleum is evoling at such a rapid rate that these subjects are covered in other, separate chapters of this book. Yet the greatest use for petroleum and its products now is to furnish fuels for heat and mobility. There is an ever-changing economic balance between the need for energy fuels and that for other petroleum-derived products. Many decades have been spent in perfecting technology to give the least expensive fuels for the most efficient energy consumption. Future processing technology will add another dimension: increased concern about the relation of increased energy use to environmental changes. We are only beginning to identify and to quantify how future energy needs might be satisfied in environmentally compatible ways.